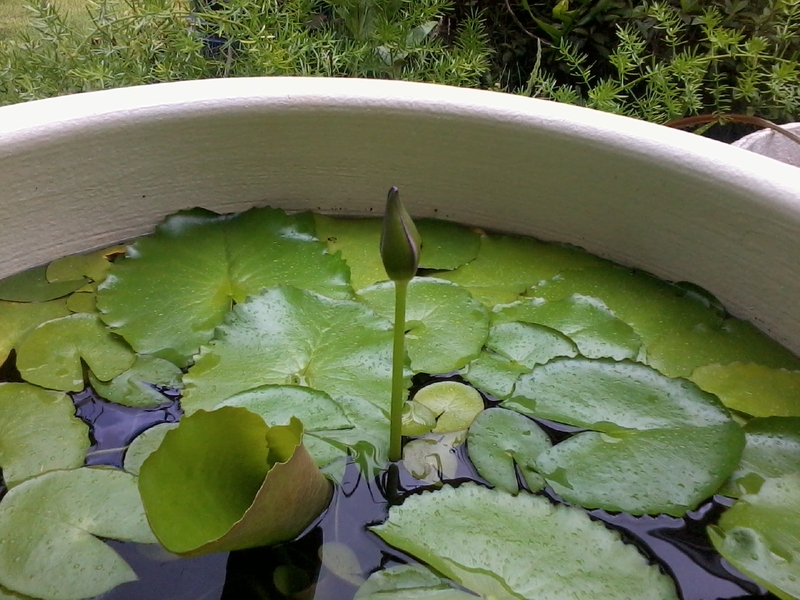 One afternoon, while feeding my fish, I see a little bud sticking out of the water. Excited, I get my camera and take this pic. Next day I check again and it’s longer. A couple of days later, it’s a full fledged flower. So beautiful! 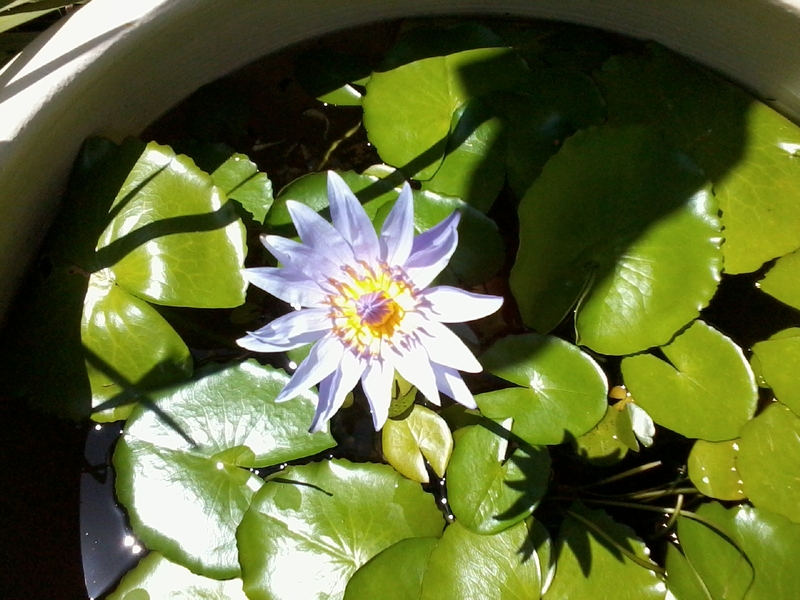 Now I’m hooked, I love this water lily! I’m so neurotic now, checking everyday to see if anything will kill it. Picking out some of the snails, weeding out the dead leaves. Now the flower has died, and it falls limp to the side, poor flower. The nex t day I check again and look!2 more buds! 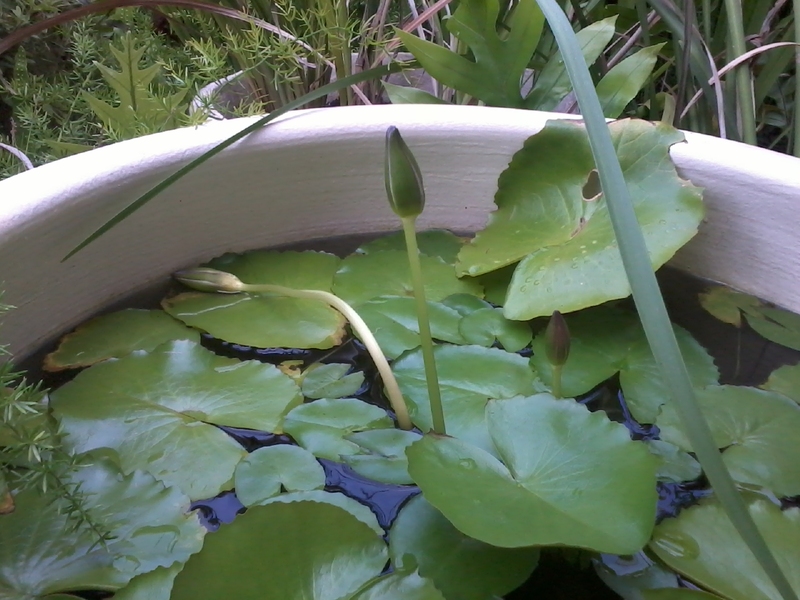 Think I may have to search the internet again to keep my waterlily alive! 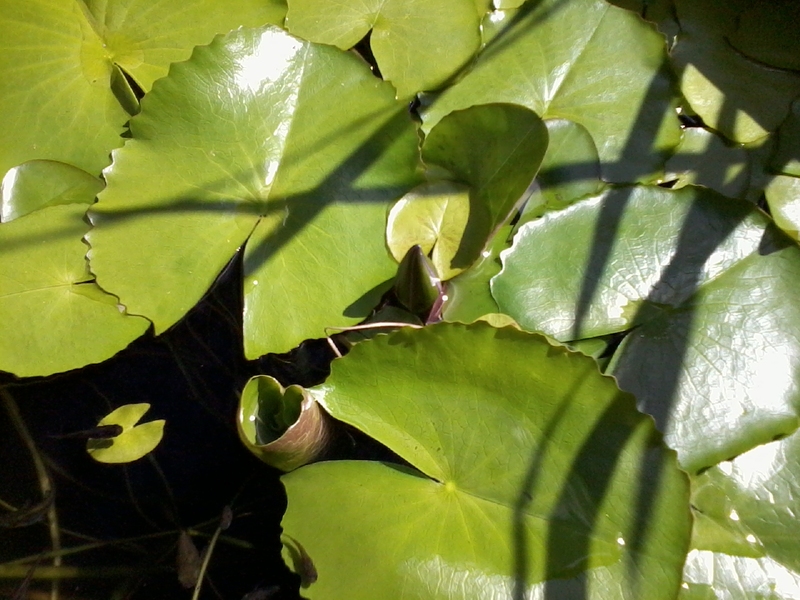 The water lily plant is doing soooo well. It even came with some snails and they are doing sooo well. 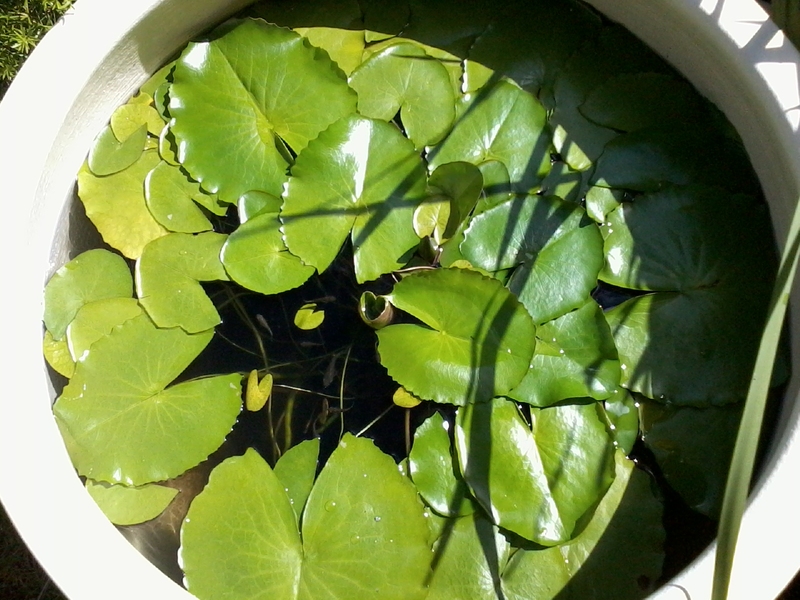 The leaves almost cover the surface of the bowl. It gives me so much joy to see it grow so well. I think it’s like therapy, feeding the fish everyday and sitting and watching them. I’m thinking of placing it in another location, closer to my bench. Well, that’s another project. 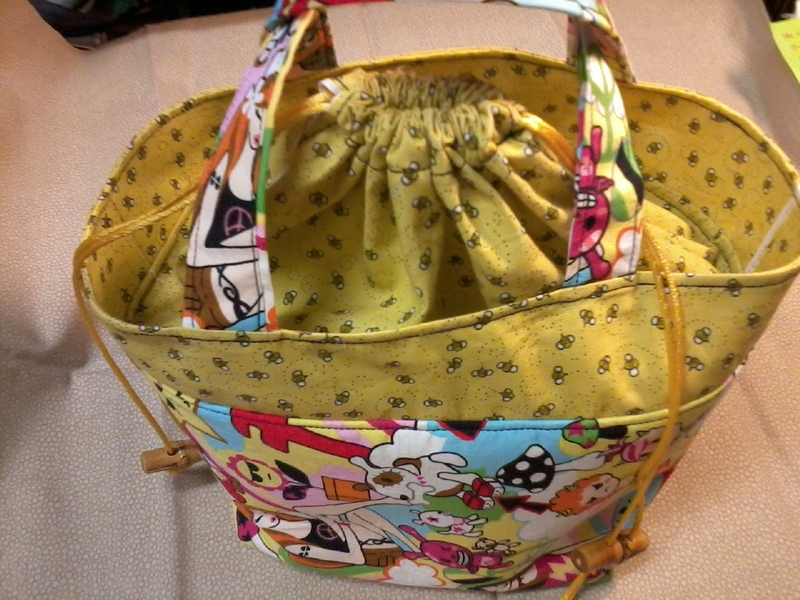 Okay so this is my version of the lunch bag from the previous post about the tutorial site. I think it’s cute but now what? And will I really use it? Guess my daughter gets another gift! Pink Penguin: Tutorial: Lunch Bag. I happened upon this web site while looking for lunch bag patterns. I’m not sure why, since I just throw my lunch in my “put everything in this bag and go to work” bag. 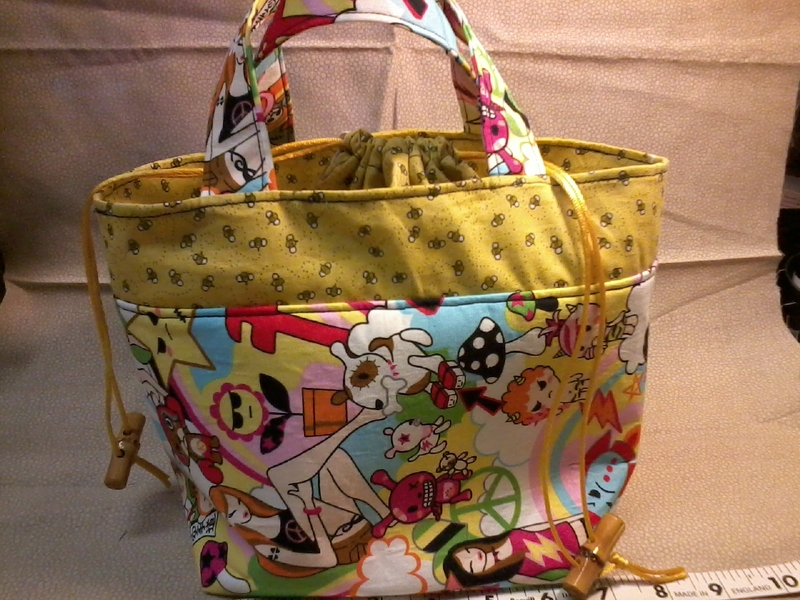 I saw some cute-o lunch bags with oh so cute-o fabric and since I do have tons of cute-o fabric and only want to make stuff that are cute-o fabric worthy, I decided to make this bag. Took me about 2 days of off and on sewing but I did finish it (cheering in the background). It’s about a 6 inch square bag and I’m not sure what to do with it. Oh well, on to the next project. This is another Japanese pattern that you have to look on the schematics (thats what they call it) to figure out the pattern (here: http://gosyo.co.jp/english/pattern/eHTML/ePDF/1103/2w/amikomo3-27_Bathroom_Set.pdf ). It started okay, ch 17, hdc in 4th ch from hook, and in nxt 16, ch 2 turn. 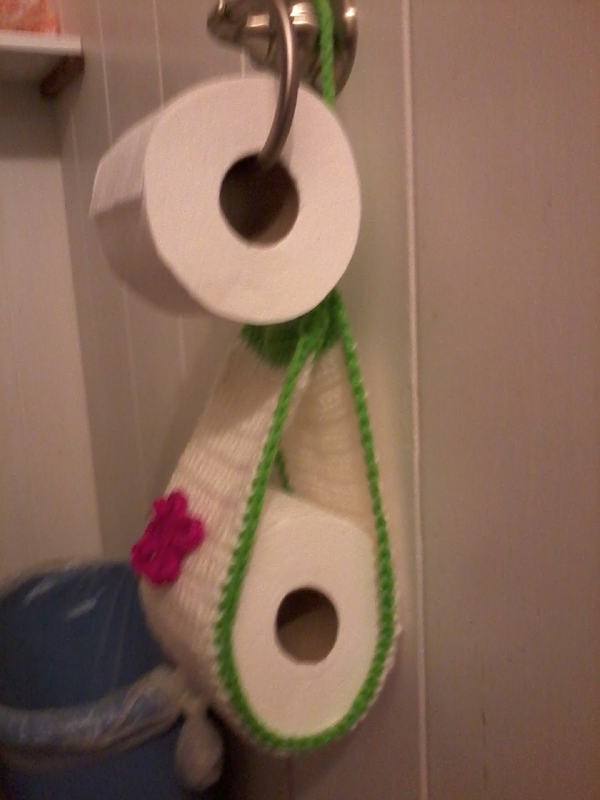 I did this until it measured 16 inches. Then it went a little fuzzy from there, I had a hard time deciphering where what should go. So I changed to color green, decided to just sc all around, doing 1 sc in each row on the side and sc in each hdc on either end. Then putting the 2 short edges together and sc thru both. At the end of the row, ch about 44 (depends how long you want it to hang). Then sl st in the other side so it loops, sl st in each ch to the other side. Tie off and weave in ends. The flower is from the pattern, titled, motif. 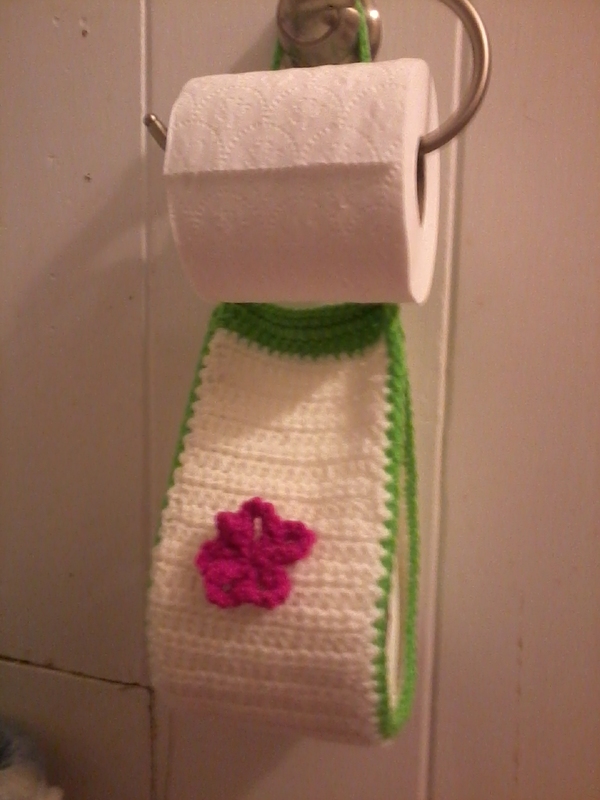 If this doesn’t make sense and you want to crochet it, drop me a line and I can write better instructions. I really like this and thought it was a pretty useful project. No? Okay, what’s next? It’s summer, the white gingers are finally blooming, and my orchid is blooming too.